I was out foraging in the Falmouth Maine area looking for nice straight twigs along the powerlines...I want to make some natural looking trellises for my vegetable garden. In particular, want to make 7' to 8' tomato towers with twigs. I collected some nice twigs yesterday, but I am not sure if they are strong enough or rot resistant enough for this application. The twigs are a red/brown color with whitish specs...I did my research and have identified as 'speckled' alder. Have you worked with this material before? Should I find something else or would this work and provide a strong long lasting product? I am also looking into pruning some apples in exchange for the twigs/wood. How is apple wood for trellis making? Hi Ben, great sleuthing work to find out what your tree is! I have used alder for furniture making and the one thing that I have found is that if it's in contact with the ground at all, or stays wet for an extended period, it's not very long lived as trellises or chairs. If you do make anything out of this pretty wood, it should be something that is displayed on a porch or indoors, not in a garden setting. Having said that, these would probably be fine for a temporary teepee or trellis for tomatoes, where you either discard them after use, or store inside where they'll stay dry for the winter. Just so you know, alder is commonly used for smoking fish and meat; generally cut into chips, it adds flavor to food items as it burns. It's also one of the very few trees that will actually burn when green. It is also great for treenware. Apple wood is extremely strong, and in my opinion this would be much better to use as a trellis. It's also great for carving, tool handles and buttons due to the fineness and tightness of the grain. All fruit woods are known as hardwoods, which also includes maple, ash and hickory. Slow growing trees are stronger, generally; 'weed' trees (those that are pioneer species, such as willow, alder and poplar, and to a certain extent birch) all tend to be fast growing, and tend to rot quickly. See more twigs for crafts here. 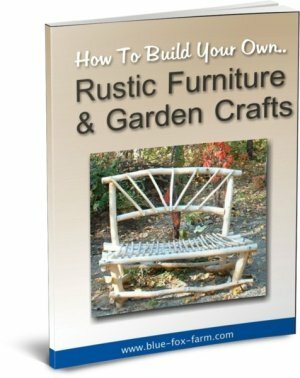 Wanting to learn more about making your own Twig Furniture? This information is helpful. I will pursue the apple twig supply as you suggest for outside application. I will post pictures when I have them built. I'll be thrilled to get some pictures, Ben! Have fun.